Melinda Staveley, born January 18, 1944, in Cincinnati, OH, has lived in Santa Barbara, California since 1993. Previous to SB, Melinda lived in Cincinnati to age 16, in Hamar, Norway; Geneva, Switzerland; Bronxville, NY; Atlanta, GA; Dallas, TX; Kingston, Ontario Canada; Sedona, AZ; and Tucson AZ. Melinda earned a BA in International Relations from Sarah Lawrence College, Bronxville, NY, spending her Junior Year in Geneva, Switzerland; a BS in Nursing and a Masters in Community Health from the University of Arizona. Having taught at every level from Pre-School to College undergrads, Melinda found her passion while attending the University of AZ Nursing School – working with people with physical and cognitive disabilities. She retired May 2016, from a 33 year career in the field of Physical Medicine and Rehabilitation. As an RN/CRRN she developed the role of Patient Family Education Coordinator for the Rehabilitation Unit at St. Mary’s Hospital in Tucson. As Administrator for Rehabilitation Services for the Carondolet Health Services she provided oversight of 3 rehabilitation inpatient units and four outpatient centers as well as serving as the liaison to the corporate administration of the Carondolet system. Melinda became a CARF surveyor in 1986 serving in both the Administrative and Program roles, completing to date 50 CARF surveys. Services for Rehabilitation Institute at Sant Barbara (RISB). In 2002, she was appointed by the Board of Directors as President/CEO, RISB. – In 2007, RISB became part of Santa Barbara Cottage Hospital, one of the Cottage Health hospitals. Her title changed to Vice President for the facility, renamed Cot- tage Rehabilitation Hospital, and she served on Cottage Health Executive Management Team until her retirement in 2016. Melinda also served as President/CEO of the RISB Foundation during her years with RISB. is a member of the Santa Barbara Foundation’s Women’s Fund Research Committee. 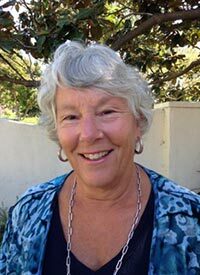 served as president of the Board of Trustees of Montessori Center School inSanta Barbara Internationally, since her retirement, Melinda has volunteered with Global Volunteers in Ciego de Avila, Cuba and Ipalamwa, Tanzania to which she will return in July 2018, to assist in the operational development of the newly built, with donations through Global Volunteers, Ipalamwa Health Center.